You’ve probably heard of robot vacuums before, but have you heard of robot mops? These take the hassle out of keeping your hard floors clean! Think about it: no more buckets of dirty water, no more greying mop heads, no more elbow grease required! The problem is that there are a ton of these products on the market. As such, it’s often difficult to tell which models are actually worth their price. That’s where we come in! Take a look at the list below – these are all high-quality products, broken up by price. Robot mops are emerging tech, and as a result, you might not want to spend a whole lot of money on one. We get that, which is why we’ve selected three of the best budget robot mops on the market for your consideration. These might be inexpensive, but they’re definitely not cheaply made. 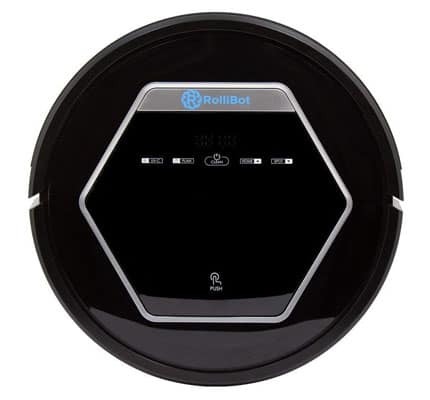 The ROLLIBOT BL618 costs around $170 and offers the complete package: a robot mop, vacuum, and UV sterilizer, all in one unit. 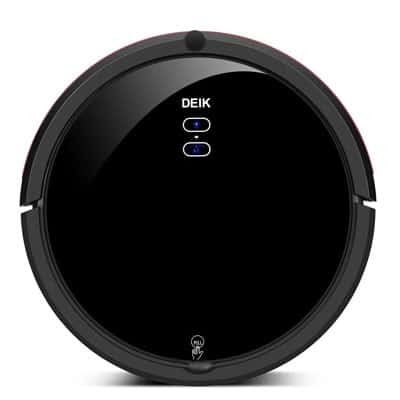 It has four cleaning modes, ten sensors, and even does a good job at picking up pet hair, dander, and allergens. So how well does it mop? Since there’s no water reservoir, you’re supposed to wet the cleaning pad first. However, you might see better results if you wet the floor instead. It’s pretty thorough in its route, though, and we liked that the waste bin is washable, since it makes cleaning very simple. Although there is no official information on it, user feedback seems to indicate a slightly longer charge time. However, we liked that this model is capable of returning itself to the charging dock as required. This isn’t a feature often seen in low-cost models, so it’s good to find it included here. The fact that this mop can be used wet or dry, and cover various different surfaces is also a huge plus. Despite not having a dedicated smartphone app or Alexa support, it does come with a remote control, so you have some degree of control over it without physically pressing the buttons. In short, the BL618 represents good value for its price range. Unlike the previous model, the Deik actually has its own 0.65L water tank, allowing it to mop far larger areas of your home. It also comes with a 0.9L dust tray, extra filters, and replacement brushes, so it’s pretty much an all-in-one house cleaning unit. Considering it costs around $150, that’s pretty good! The battery life is also decent, and the unit can return to the charger when it starts running out juice. We’re particularly fond of the 30-day money back guarantee and 15-month warranty on this product – it speaks to Deik’s confidence and the mop’s longevity. There are all sorts of features built into this product to ensure it lasts as long as possible. Take the collision or drop sensors, for instance. This is great – although it’s a fairly inexpensive product, you want to protect your investment, after all. Simply, this product is designed for people who just want their mop to take care of things for them. You can program it to start at specific times on specific days, so once you’ve set it up, there’s actually very little interaction required besides emptying and refilling its reservoir. This product mops floors using a removable washable pad, so it’s better for smaller areas. With an exceptional battery life, it allows you to clean for extended periods of time, after which it’ll return to the dock for charging. There’s even a remote control in case you’d like to interrupt a programmed clean. The G270 comes with a 30-day money back guarantee and 12-month warranty, so you’re covered in the event of any issues. It pays to be wary of low-cost products, but at around $140, this one seems to be built particularly well. It seems that this product is best suited towards people with smaller homes. Don’t get us wrong – it’ll work just fine in large areas, but with a dust capacity of just 0.3L, it will require a little extra attention. Still, at this price, it’s difficult to be too critical. The G270 does lots of things reasonably well, instead of being just an efficient robot mop. This is admirable, but if you’re only in the market for a mop, you might be better off with a different model. 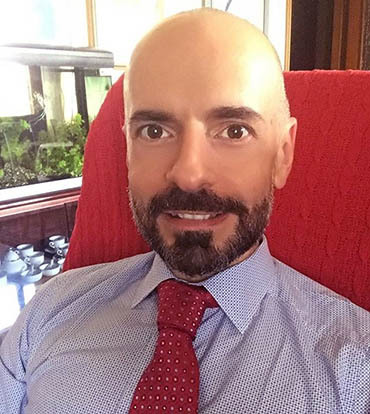 Even a slight increase in budget can unlock scores of new features and additional functionality. This is made particularly clear in the mid-budget price range. Take a look at the products below – these represent a marked improvement over the budget models but without the cost of the premium selections. 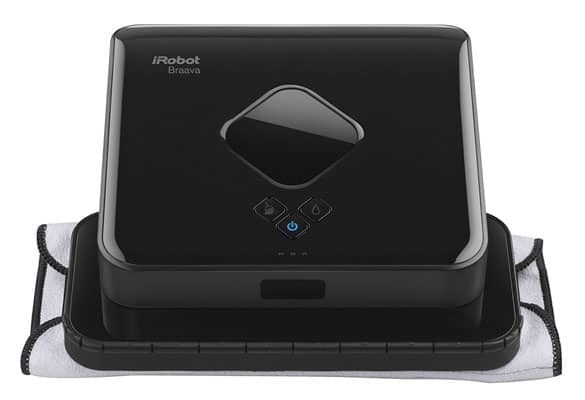 The iRobot Braava jet 240 offers three different cleaning modes: wet mopping, damp sweeping, and dry sweeping. 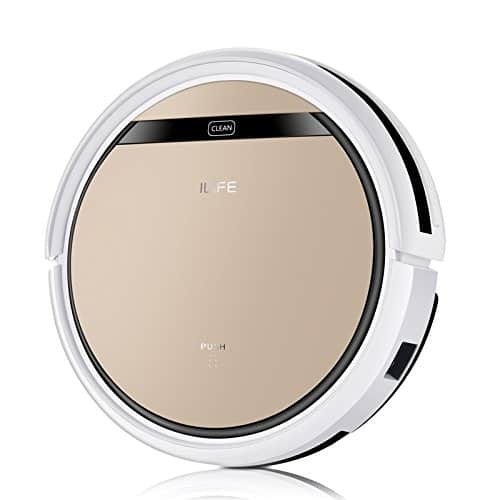 You might have noticed that its battery life is very short – this helps keep the total recharge time to a minimum while giving you time to thoroughly mop a couple of rooms at a time. With built-in edge and stair detection, you don’t have to worry about the 240 getting your walls or rugs wet. Plus, with a vibrating cleaning head, it has a better chance to remove dirt and stains than some of its competitors. At around $170, and with a strong focus on mopping instead of sweeping, this product won’t be for everyone. It’s ideal for homes with hard floors in a handful of rooms, but if you don’t have any carpets, you’ll find that several recharges are required, which is a bit of a shame. When it comes to mopping, though, there are few products in this price bracket that can compete. The only thing that would have made this product better is if it automatically recharged itself, but as it uses a battery pack, that’s not possible. Regardless, this is a great product and we highly recommend it. This mop costs around $180 and doesn’t have a water reservoir, so what does it do to justify its price? Well, that’s easy: it has a very long battery life, and self-rescue features so you never have to pull it out from under the couch. It can automatically adjust to different types of flooring too, which is a plus. 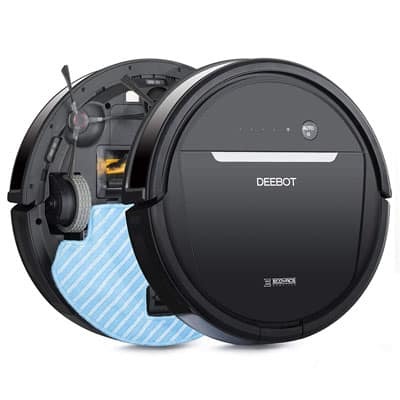 With the ability to schedule cleans and return to the charging port when the battery is low, this model is perfect for those who are too busy to clean. Just tell it to start mopping during the day when you’re at work, and you’ll come home to sparkling floors. We’re big fans of the extended battery life that the V5s has. Its low profile design makes it far less likely to get stuck underneath furniture when you’re out, too, so you really have nothing to worry about. There are four cleaning modes to choose from, including one that patrols the edges of the room, and one for dirty spots. This gives you full control over your cleaning, and you don’t even have to be in the same location. 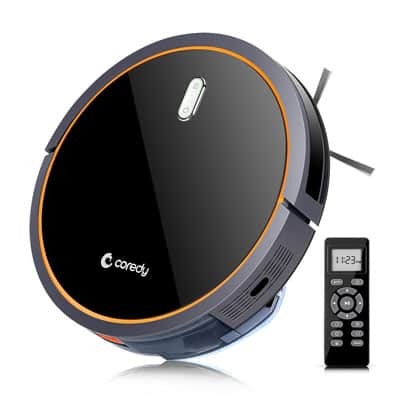 If it had a smartphone app for remote control, it’d be the perfect robot mop. The Coredy Robot Mop is a highly customizable reservoir-based mop with vacuum functionality also included. It has five different cleaning modes, brushes on either side and makes less than 60dB of noise – that’s roughly equivalent to the noise a dishwasher makes. Sure, you won’t want to sleep with it on, but it’s likely a huge improvement over your existing vacuum. It uses sensors to detect nearby objects and automatically slow down. Better still, the pressure-sensitive bumpers ensure you won’t scuff your skirting boards or furniture. There’s a remote control provided which gives you full control over the mop and even allows you to program a schedule. We like that this system can detect what kind of flooring it’s on and adjust accordingly. As an added bonus, it uses a HEPA filter to collect smaller particles than some of its rivals. However, the thing that really sets it apart is its 2.8” height – that’s small enough to ensure it never gets stuck! If you have pets, mixed flooring, and a busy schedule, the Coredy mop may well be a strong choice. It offers great flexibility, and frankly, we’re surprised it doesn’t cost a lot more. Now we’re really getting serious. The products below aren’t for everyone – after all, they’re a little more expensive. That said, those that can afford them will find that they offer unmatched versatility and extra functions designed to make your life as easy as possible. If a mop costs around $300, you’d expect it to be exceptional. 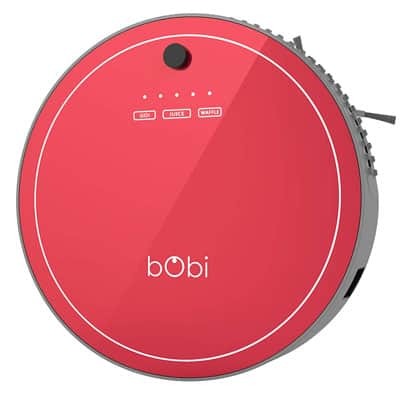 We’re happy to say, the bObi Pet does not disappoint. It’s solidly built, with a rugged frame and is capable of sweeping, mopping, sterilizing, and filtering. It even has a fully submersible dust tray, so you can thoroughly clean it out after use. This mop boasts several different cleaning modes, as well as strong suction designed to pick up even the most stubborn pet hairs. It’s also capable of returning to the charging dock whenever the internal battery reaches 15%, so you don’t have to worry about that. Simply, it’s a fire and forget cleaning solution. We’re always skeptical when it comes to expensive gadgets, but the bObi really earns its price tag. Everything about it is sophisticated, from the algorithms it uses to move around to the soft-touch material it’s made from. If appearances are important, bObi’s cherry red color will surely be appealing. While a remote control is included, there’s no app or Alexa support, which is a shame as this would have made it simply unmissable. Still, it’s an excellent product for larger homes, even without. 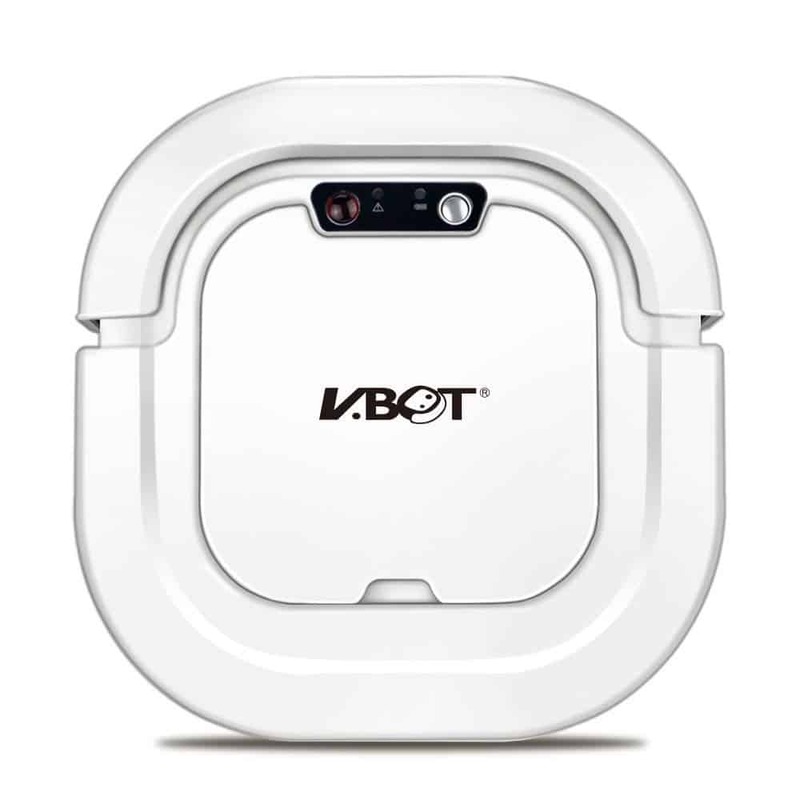 The ECOVACS DEEBOT M80 aims to make your cleaning as straightforward as possible. It costs around $220, and can both sweep and mop. Further, you can schedule cleaning using either the smartphone app or using your Amazon Alexa – perfect for tidying up while you’re out at work. It has a 0.5L water reservoir and an anti-spill dust tray, making it ideal for extended cleaning sessions. The battery lasts for almost two hours at a time, and the M80 can return to the dock for recharging as required. With three cleaning modes, you’re in complete control, even when out of the house. One of the things we like about the M80 is that it doesn’t leave your floors soaking. Instead, it mops and dries the area in a single pass. This is particularly useful if you have large rooms since you don’t have to wait for it to make another loop. This product is best-suited to homes with a lot of tech. It does come with a remote control, but it’s far easier to just use voice commands or the app, especially if you think you might have to clean on short notice. All in all, it’s not a bad choice. 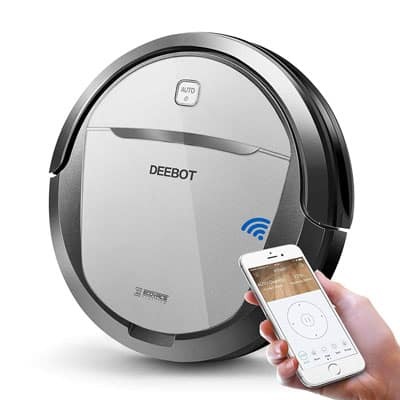 The DEEBOT OZMO 601 is the most expensive product in our list, at around $400. So what does it offer? 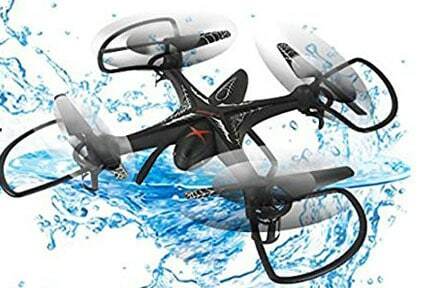 Let’s rattle off some of its features to give you an idea: Alexa support, controlled water flow, three cleaning modes, edge and drop sensors, a year’s warranty, and almost two hours per charge. Does that do anything for you? There’s also a dedicated app for your cell phone that allows you to set up a cleaning schedule. At around 65dB, it’s not the quietest product around, but given its above-average suction and power, we believe that this is a fair trade-off. Obviously, this unit is far more advanced than most people need. However, if you have a really large house with lots of hard flooring and don’t mind paying a little more for a product that’ll take care of it all, the OZMO 601 would be an excellent choice. There is one issue, but it’s fairly minor. The smartphone app only works on 2.4GHz WiFi, so if you have a dual-band router, you’ll need to ensure it connects to the correct network. In terms of sheer cleaning potential, though, there are very few models that can compete with this one. This section is devoted to the product that is suitable for the majority of readers. 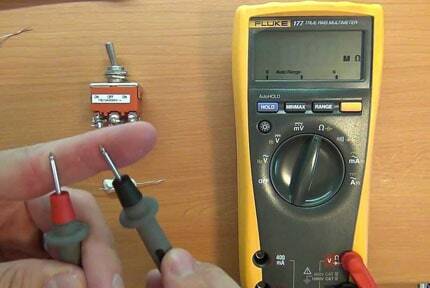 It might not be the most advanced product, but it’s usually less expensive. In this case, there was a lot of competitions but we finally decided that none were more deserving than the iRobot Braava 380t. 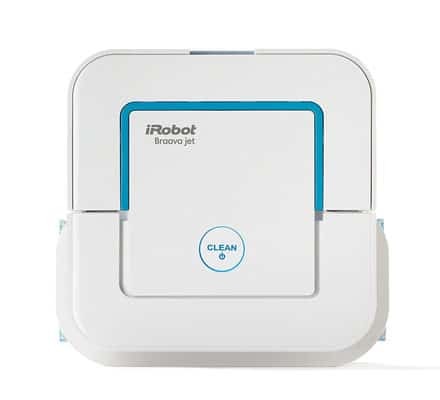 The iRobot Braava 380t costs around $250 and can sweep and mop for about 90 minutes per charge. Here’s the good part: thanks to the turbo-speed charger, it only takes two hours instead of four to get the battery back to full. This means you’ll spend less time waiting around and more time actually getting things done. There isn’t a reservoir, though. As such, it’s suitable for generally sprucing up an area, but it probably won’t remove sticky residue or stains. It includes a Braava cube which generates a virtual map of your room for the mop to follow, though. This reduces the chance of it getting stuck underneath furniture and keeps things moving forward. We like that this unit has a very simple design. There are just a handful of buttons on the top, which keeps things simple. There isn’t a remote control or anything, though, and it can’t be programmed, making it more of an occasional use kind of product. Still, it’s always good to have around for those days when you’re just too busy.